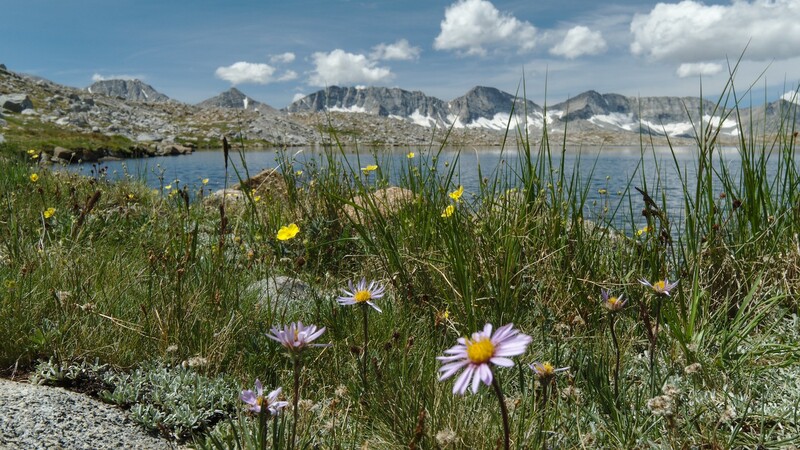 Granite Park and Humphreys Basin are two beautiful, high-altitude locations in the Sierra Nevada that you really must visit. 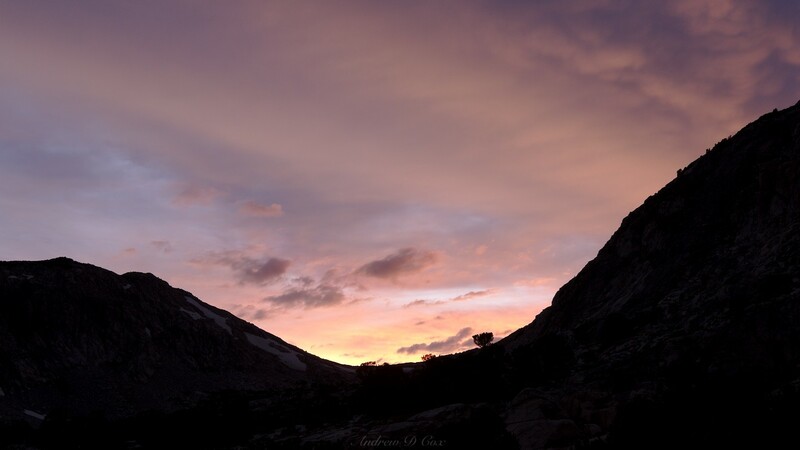 A friend of mine introduced me to Granite Park a few years ago and I was blown away by the alpine landscapes. For this trip another friend, Diane, is flying out to visit the Sierras for the very first time. I wanted her to see the best the Sierras have to offer and immediately thought of this area. 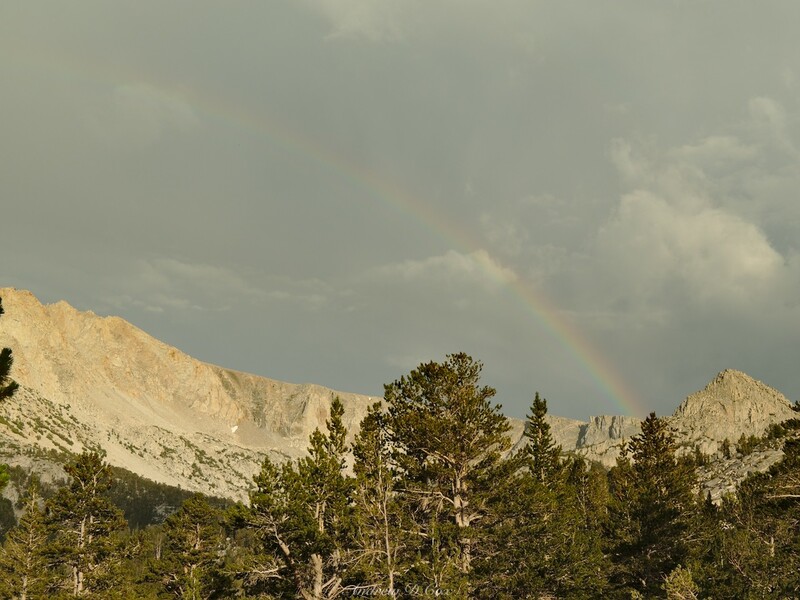 With two cars available, we planned a small thru-hike between the Pine Creek and Piute Pass trailheads. 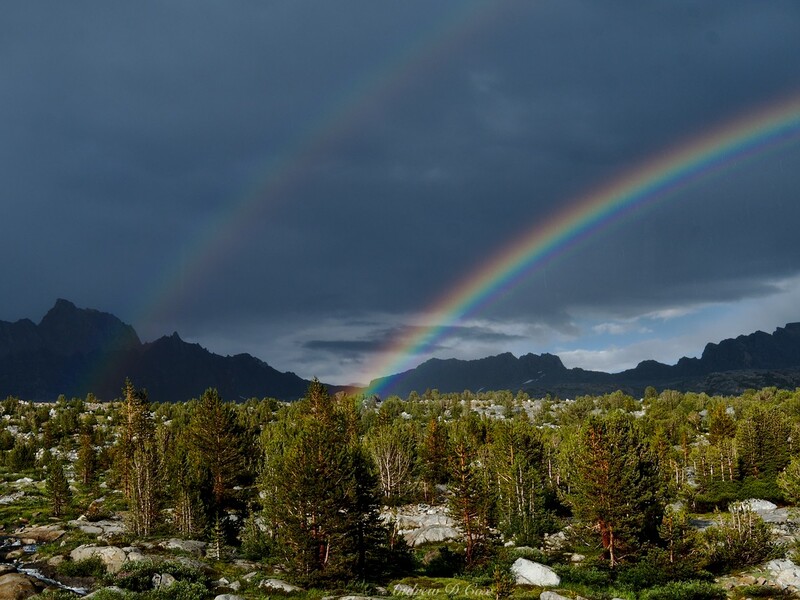 Between sunny mornings, stormy afternoons, epic rainbows, and cross-country hiking, we had a fantastic time! Route – Begin at the Pine Creek Trailhead and climb the trail to Pine Creek Pass (optional: head up toward Italy Pass to visit the beautiful Granite Park). 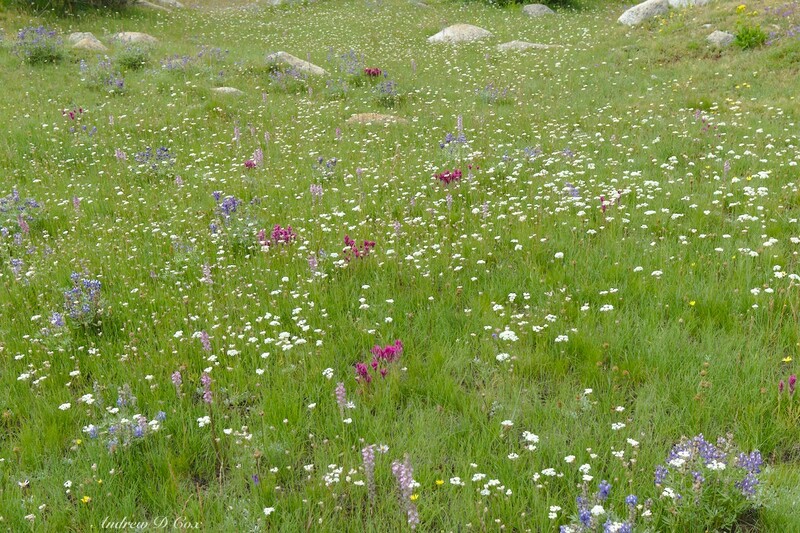 Descend through beautiful alpine meadows in French Canyon to the junction at Hutchinson Meadow. 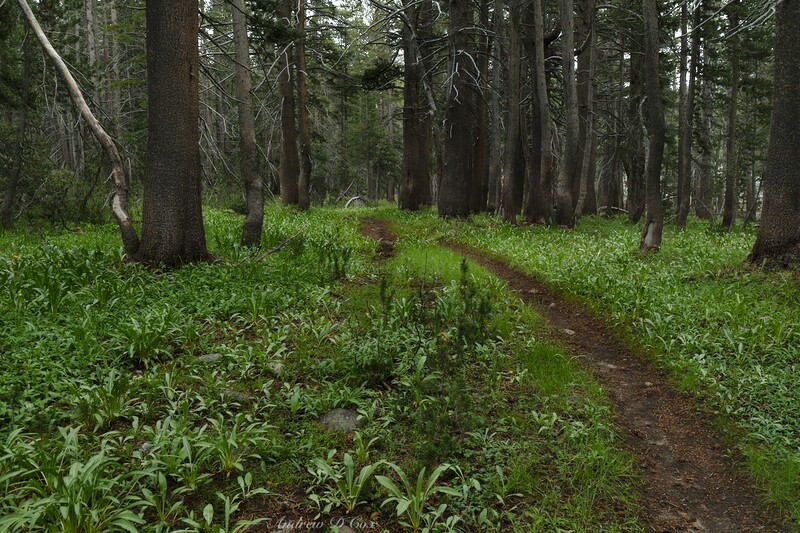 Turn east and begin a gradual climb through dense pine forest toward Piute Pass and Humphreys Basin. 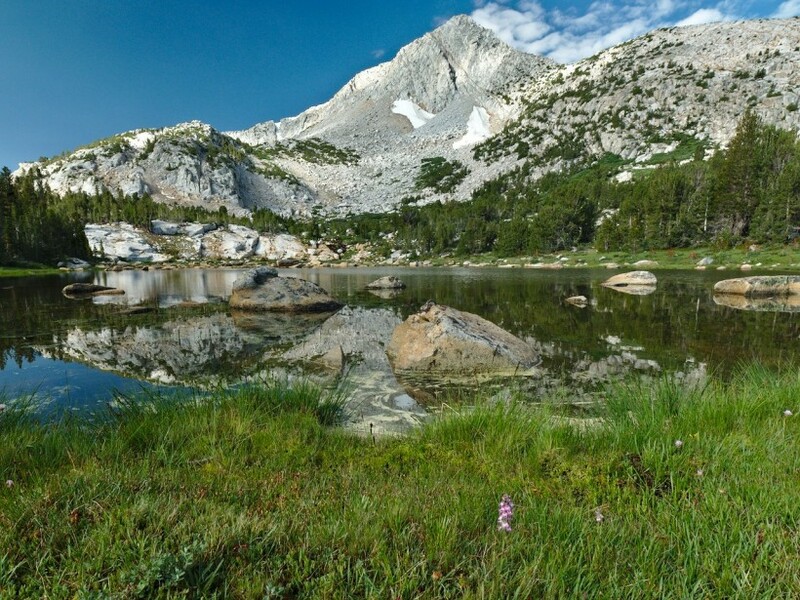 After passing above treeline, turn north on the faint trail and hike to Desolation Lake. 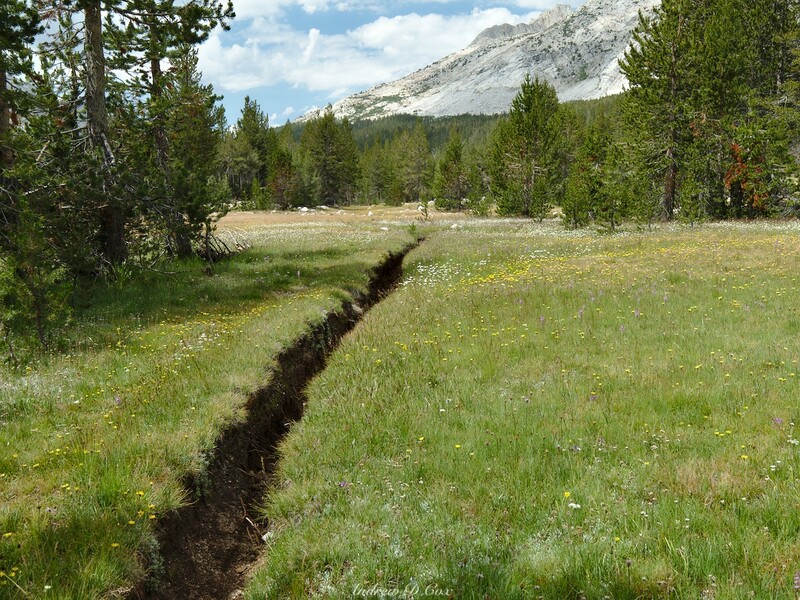 Continue off-trail through boggy meadows to the outlet stream flowing from Forsaken Lake. Clamber up the class II talus south-east of Forsaken Lake to the low saddle and then descend easy terrain to Humphrey’s Lakes. 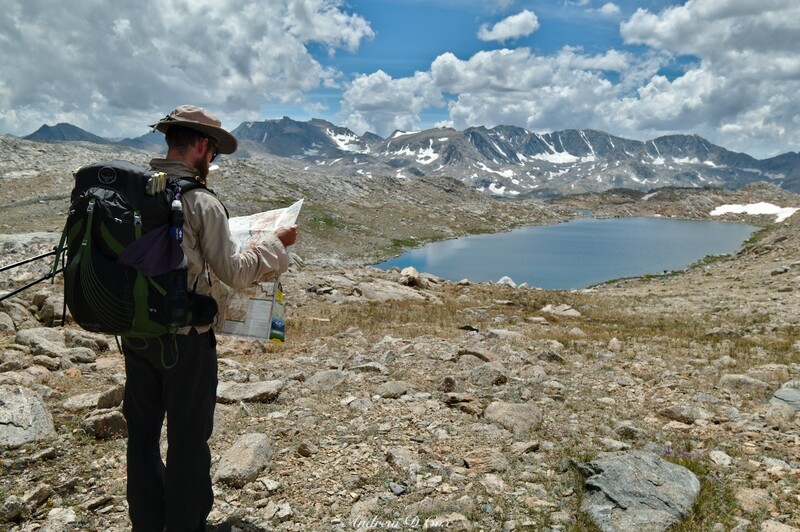 Although most maps depict a trail leading back to Piute Pass, it is practically impossible to find. Rather than searching for the nonexistent path, continue to navigate cross-country south-southeast down grassy ramps until reaching the steep slope overlooking Summit Lake. 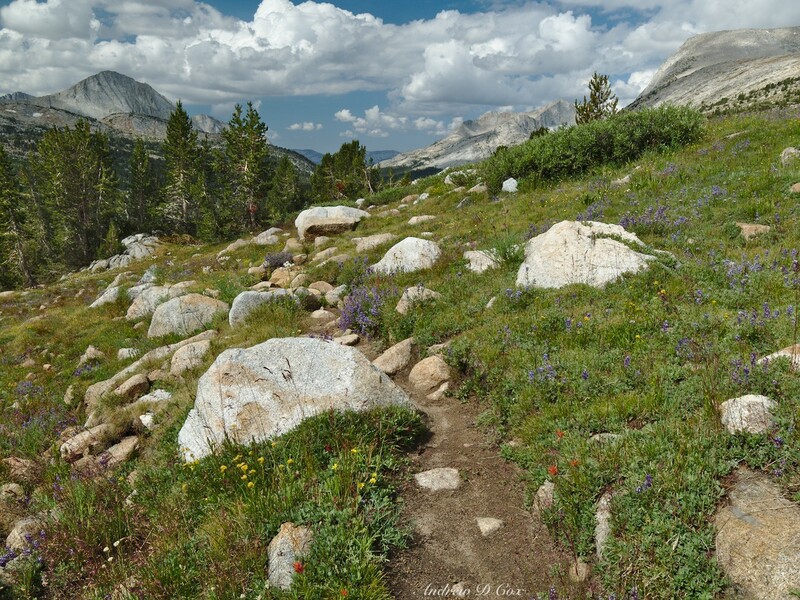 Here, a few cairns and a faint trail lead down to Piute Pass. 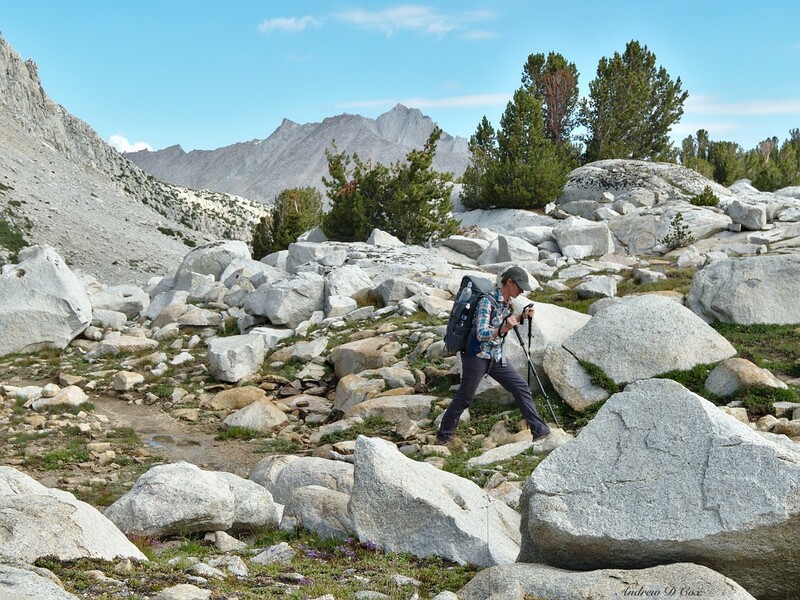 From the pass, follow the well-traveled trail to the Piute Pass Trailhead. Permits & Regulations – A permit is required for all overnight travel in this area. 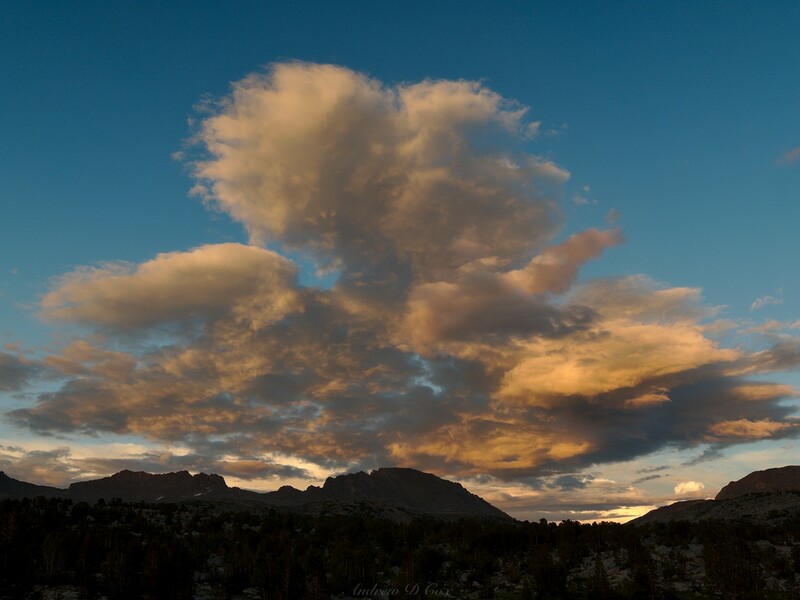 Reserve a wilderness permit online from Recreation.gov; search for Inyo National Forest Wilderness Permit and select the Pine Creek (JM11) trail as the entry point. Alternatively, you can try to snag a walk-up permit from the White Mountain Ranger Station. 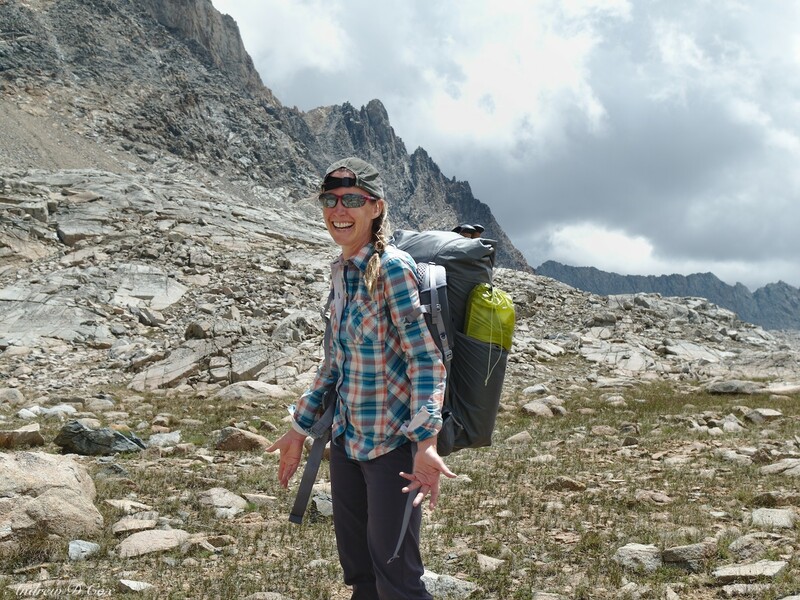 Bear canisters are not required, but are recommended; hanging a bear bag from the scraggly pines that dominate this region is difficult, and much of the route is above treeline. 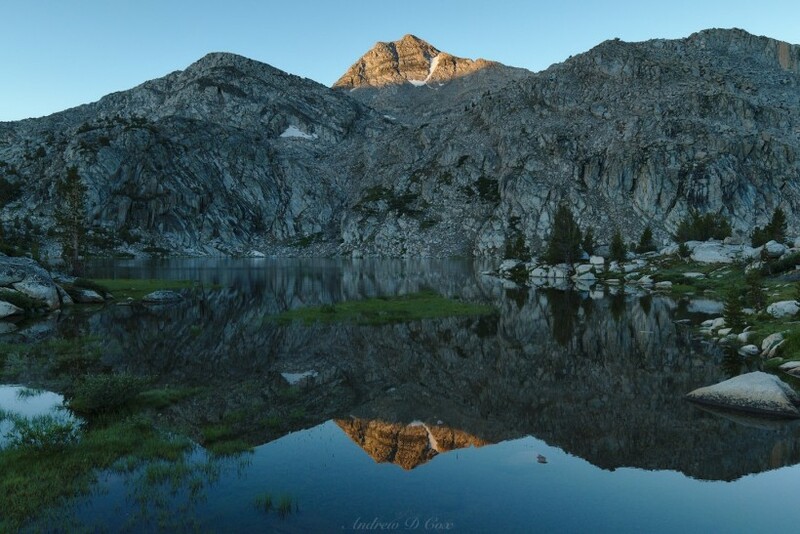 As always, practice leave no trace ethics to preserve this beautiful wilderness for others! Logistics – Park in the obvious lot near the pack station at the Pine Creek trailhead. At the other end of the trail, park a few tenths of a mile from the trailhead at the pack station. Bear boxes are present at Pine Creek, but we didn’t see any near the parking at the Piute Pass end. 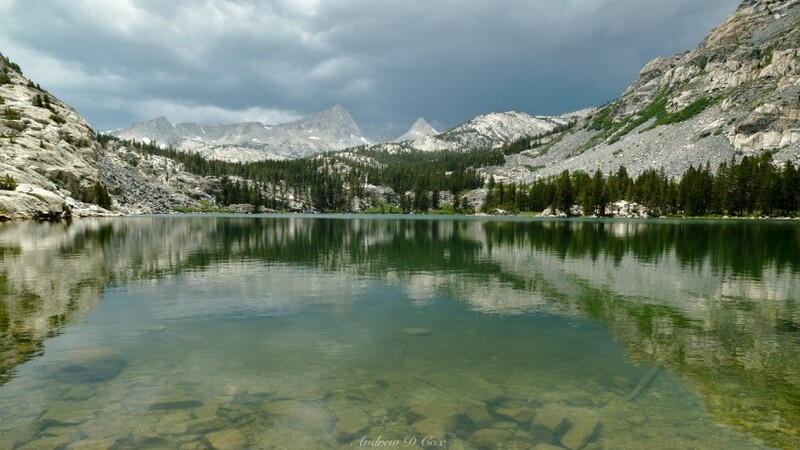 Resources – I recommend the National Geographic Mammoth Lakes / Mono Basin map. There is also a Tom Harrison map covering this region. Josh, Daniel, Diane, and I spent the night at the North Lake Campground last night; Diane was the first to arrive and was able to snag a spot. The campground is beautiful, situated right next to a noisy creek with lots of jeffrey and lodgepole pines shading the sites. And, since the campground is located about 9,300′ above sea level, we were able to acclimate a bit before beginning our hike. 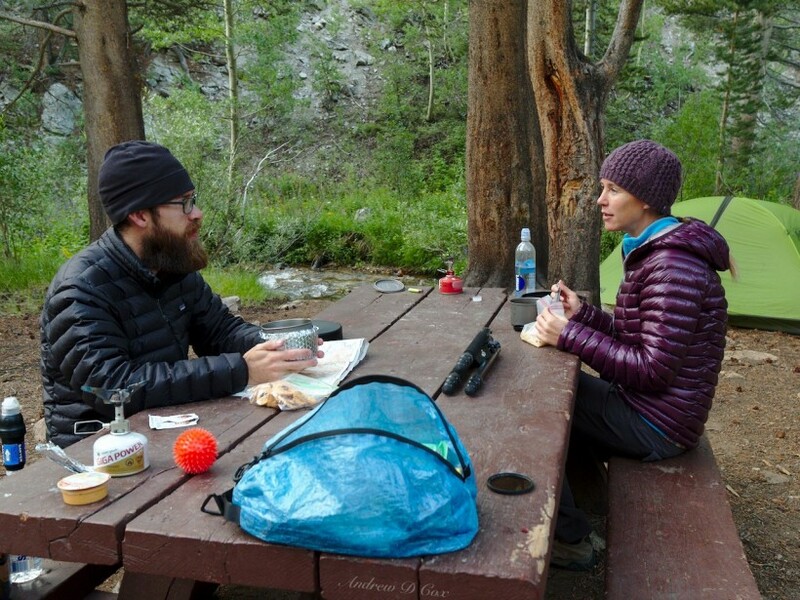 After eating breakfast and packing up our campsite, we shuttle our cars to the trailheads; one car stays near the campground at the Piute Pass parking area, and the other transports us to the Pine Creek trailhead. 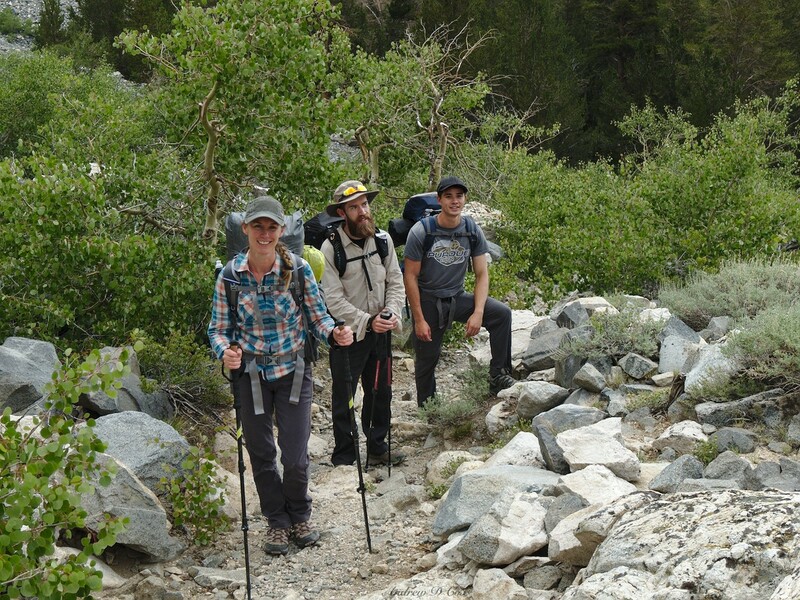 We’ll then hike back to Piute Pass and conveniently have our transportation pre-arranged. 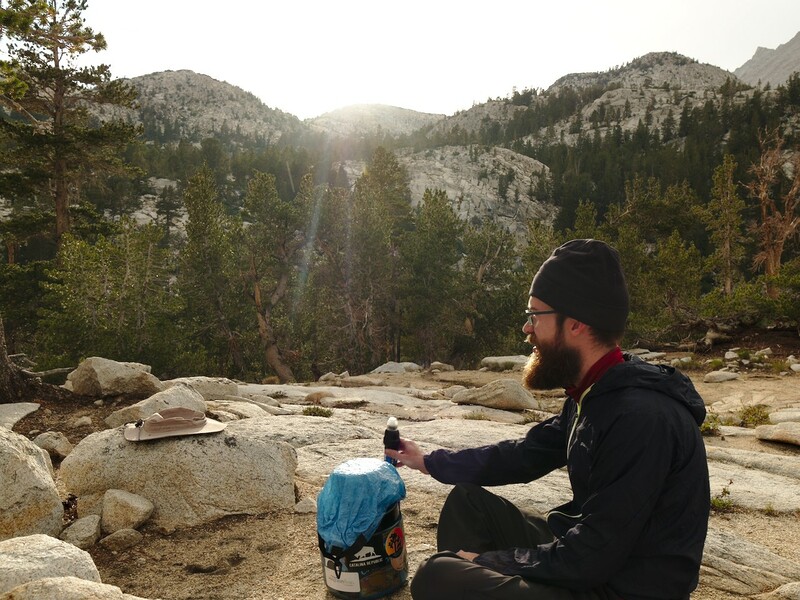 One small complicating factor is that there don’t appear to be any bear boxes at the Piute Pass parking area, so we take all of our extra scented items (e.g., deodorant, snacks for the drive home) to Pine Creek and stash them in the bear boxes located there. We begin at the Pine Creek trailhead, which is located at the pack station near the parking area. After strolling through a lovely shaded forest, we emerge into the hot sun on the first of many switchbacks. 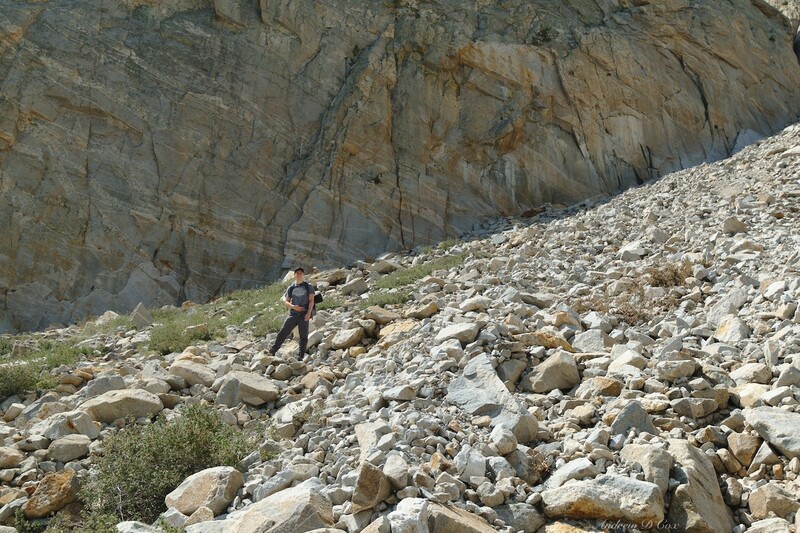 As we climb higher, a tungsten mine comes into view, offering some interest but also marring the “backcountry” vibe. We crunch past a few creeks gurgling down the slope and admire a massive cascade flowing over smooth granite ramps in the distance. Twisted juniper trees dot the hillside, and the air is filled with the sweet scent of wildflowers and sage. Partway up the rocky switchbacks, we’re forced to do a little route finding as a recent rainstorm has washed out part of the trail; a swath of talus has plowed straight down the slope. The climb is long and hot, but the scenery is fantastic! As we gain altitude, the bright sunshine occasionally gives way to shade from clouds passing overhead. A glance to the southwest reveals towering cumulonimbus clouds in the distance, a sure sign that an afternoon thunderstorm is brewing. By the time we stop for lunch at Pine Lake, the southern sky has grown dark and moody. 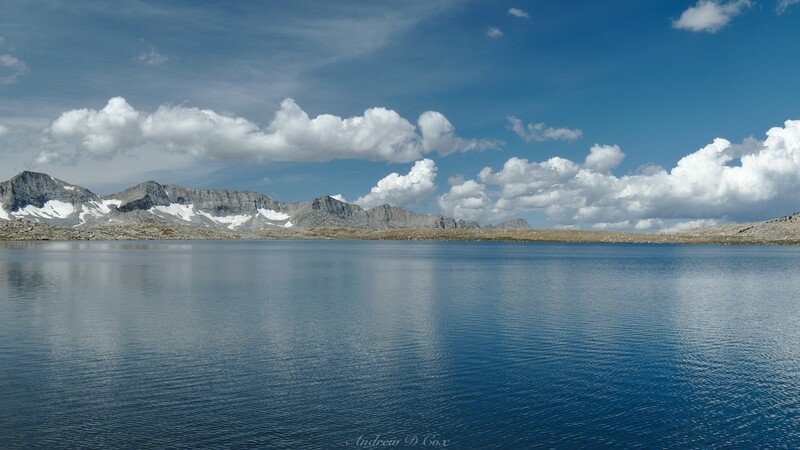 However, the skies immediately overhead remain bright and we lounge on the sunny lake shore, appreciating the pine-clad slopes and abundance of water. It’s a nice change of scenery from the dusty switchbacks! 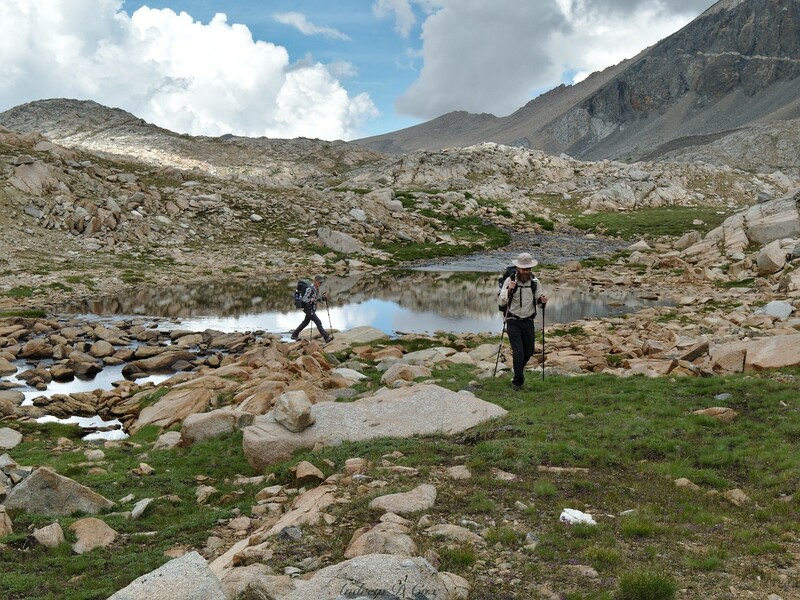 After eating lunch, we follow the trail around Pine Lake and continue ascending into the high country. Distant peals of thunder echo through the mountains, which makes me a tad nervous; it’s typically not wise to climb higher when a storm is brewing. But, we’re well below treeline and the probability that we’ll fall victim to a lightning strike is astronomically low, so we continue despite nature’s rumblings. 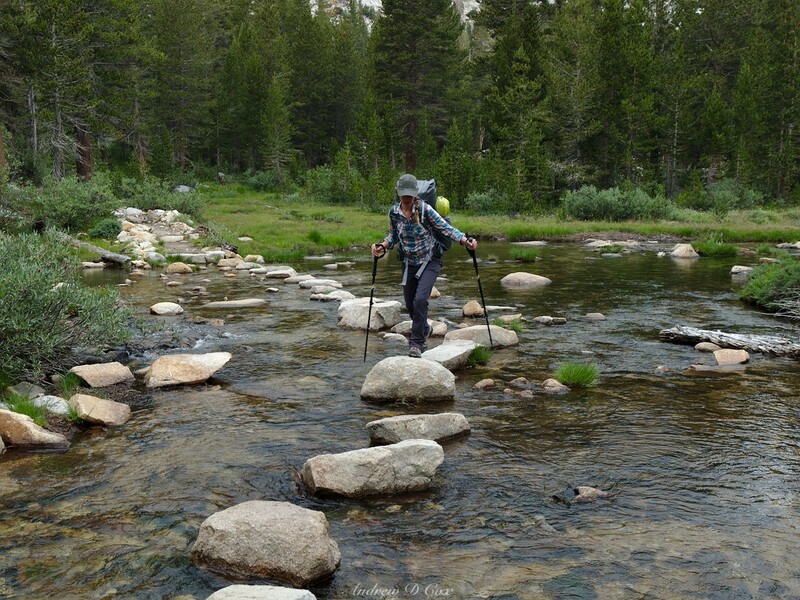 The trail to Honeymoon Lake includes several river crossings, some via log and others via well-spaced rocks. The final mile winds through a forest of pines to a swath of smooth granite that encircles the lake. 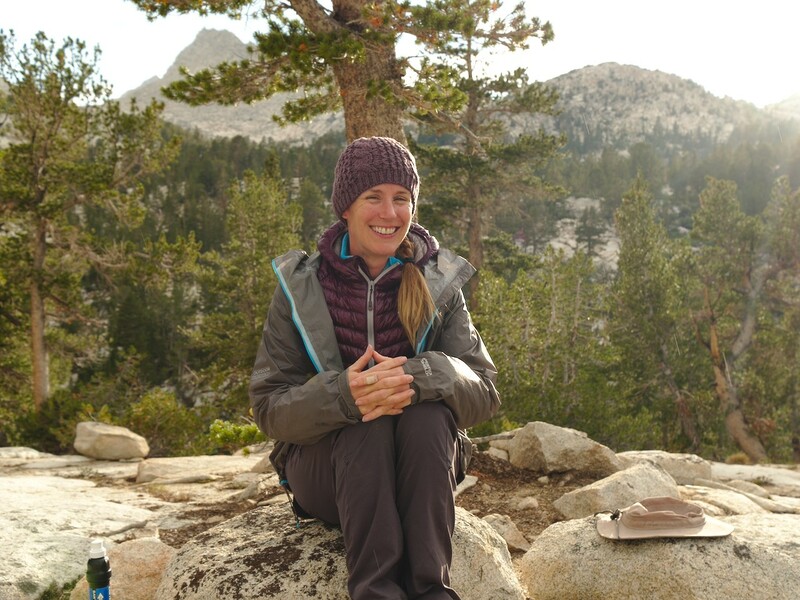 We set up camp in a light drizzle and then take off on a short day-hike toward Granite Park. Thunder still echoes above us, and the occasional bolt of lightning strikes a distant peak. We continue, albeit somewhat nervously, until we reach the edge of the treeline. We pause at a lush meadow to munch on afternoon snacks and admire the views. However, after sitting for a minute or two, the light drizzle evolves into a heavy shower and we hurry back toward camp. The storm doesn’t last long, thankfully, and the heavy rain peters out during our descent back to Honeymoon Lake. As we hike, we’re treated to some fantastic views of “striped mountain,” an unnamed peak with fantastic white striations throughout the dark rock. 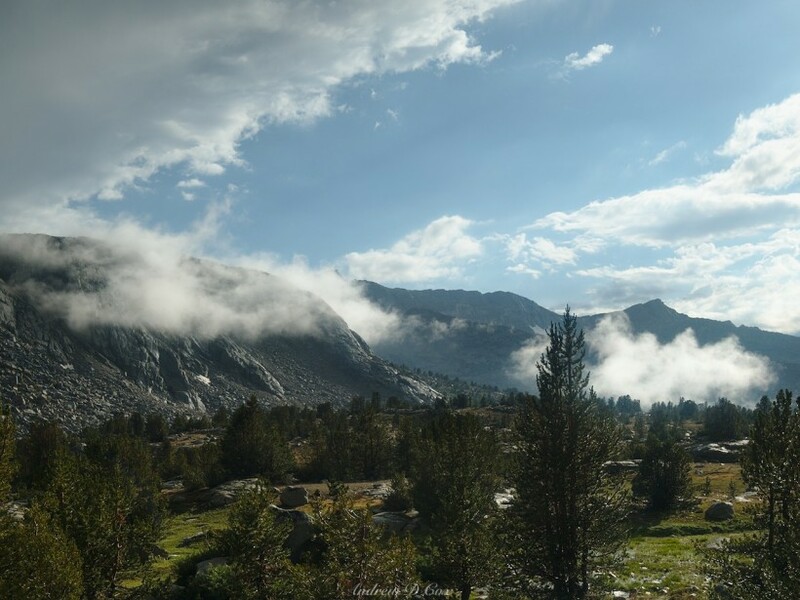 Soon after returning to our campsite, the storm clouds begin to disperse and a few rays of sunshine break through. Curiously, the drizzle continues even as the skies overhead return to a cloudless blue. We’re treated to a rainbow and more sunshine as the evening progresses, a fine end to the drizzly afternoon. Thanks to the return of the sunshine, everyone is in a fine mood this evening. We cook dinner, lounge around on the now dry granite slabs, and chat while absorbing the late afternoon rays. Eventually, we tire of sitting around and wander off to explore the lake shore. We visit several cascades feeding the lake and admire the reflections of the surrounding peaks in the water. 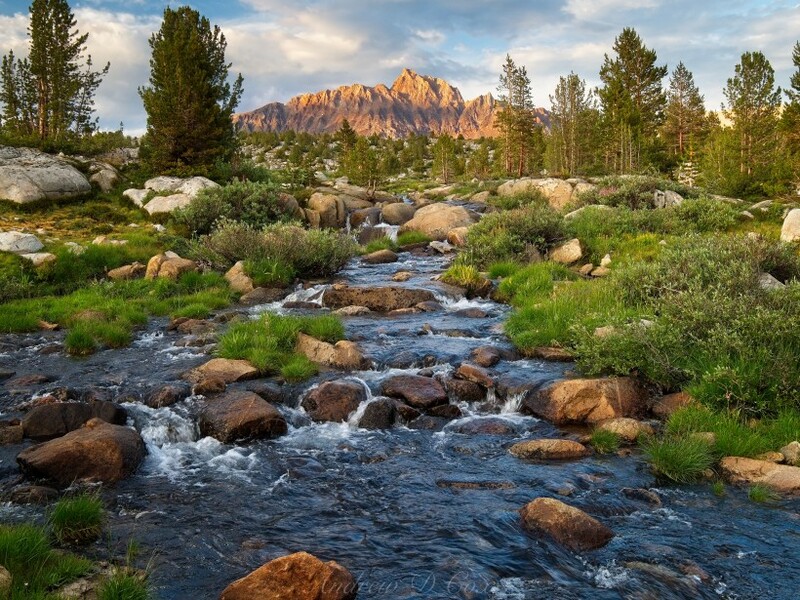 Of course, the abundance of water coincides with an abundance of mosquitoes that are determined to drink our blood; the nasty little buggers are arguably the worst part of any camping trip in these mountains. 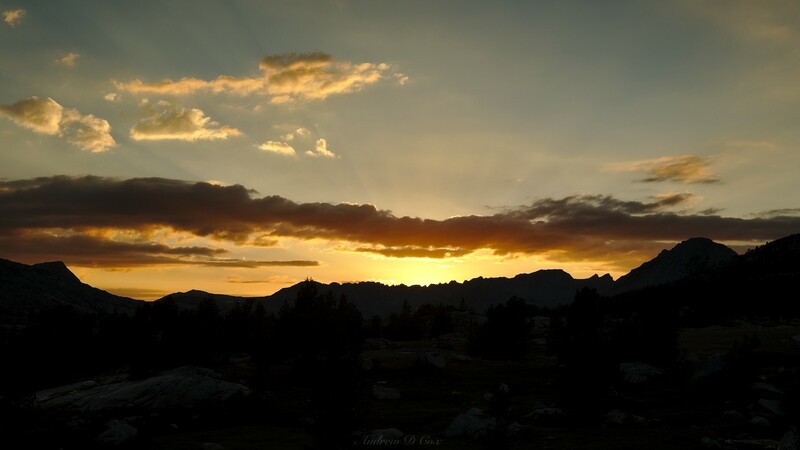 We don long sleeves and mosquito nets to watch the sun set over the mountains. Once darkness falls, we all retire to our tents, hoping for drier weather tomorrow. In the morning, a few clouds lie scattered across the sky, hinting at storms to come later in the day. For the moment, however, the sun shines down on our camp; it’s a beautiful morning! After eating breakfast and packing up, we backtrack a few tenths of a mile to the Pine Creek Pass junction and then work uphill. 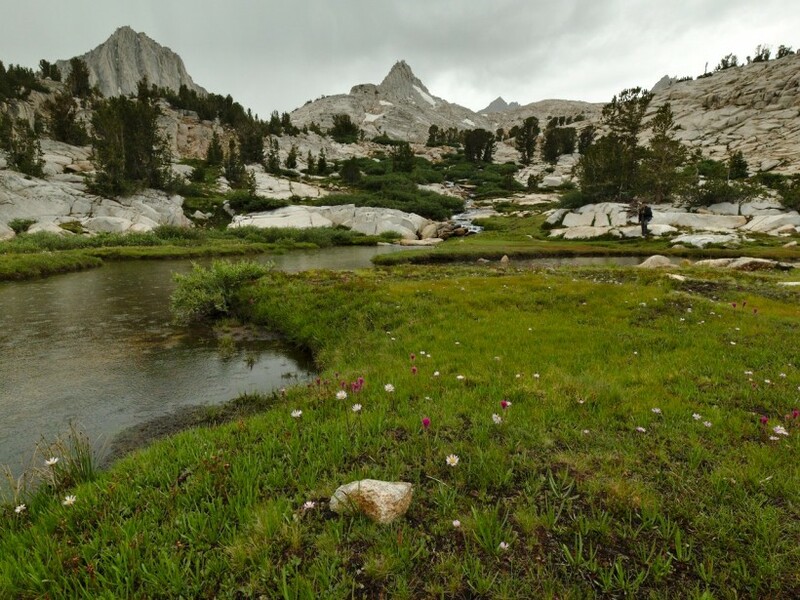 We stroll past beautiful meadows and quiet ponds while ascending the lightly sloped trail to the pass. Thanks to the gentle slope, our hike to the pass progresses quickly. I enjoy turning around every few minutes to admire the view of the valley behind us; I’m always surprised by how quickly the views change. We were far down the valley just an hour or two ago, and it seems so distant now! 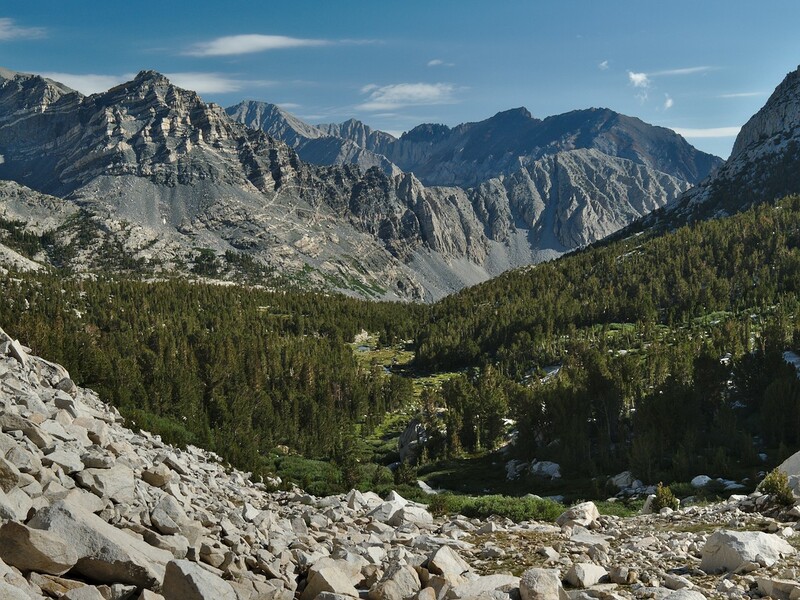 Pine Creek Pass is located in a wide saddle between two unnamed peaks amidst a bunch of scattered boulders. 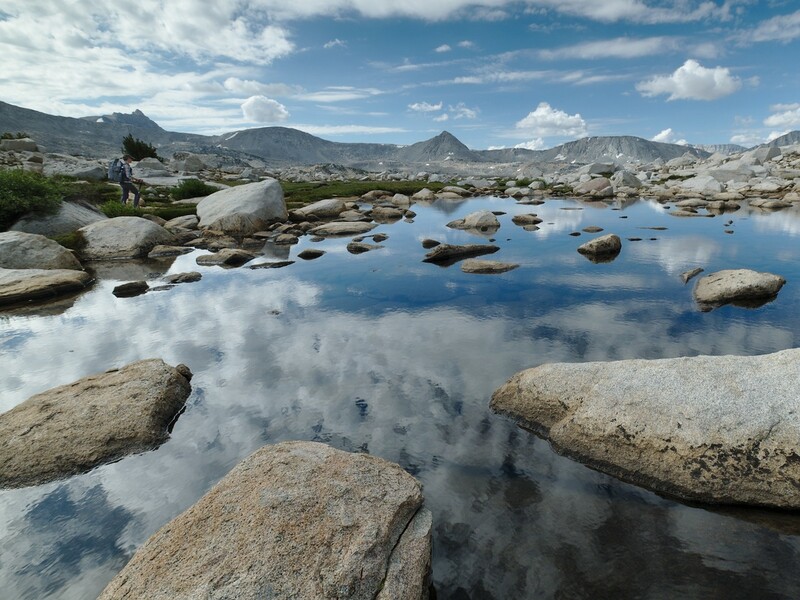 Two ponds on either side of the pass reflect the puffy clouds and distant peaks, offering some stunning photo opportunities! We take a break for a few minutes and do our best to toss around a small frisbee, but it proves difficult to control in the gusty wind. Daniel packed a lightweight kite and tries flying it, but the wind isn’t consistent enough to keep the kite airborne. 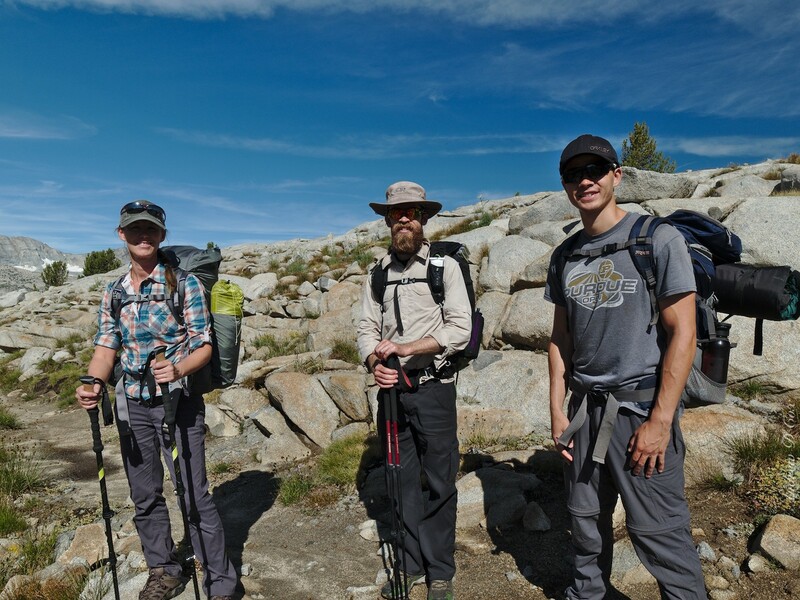 After goofing off for a little while, we re-shoulder our packs and continue down the trail into French Canyon. 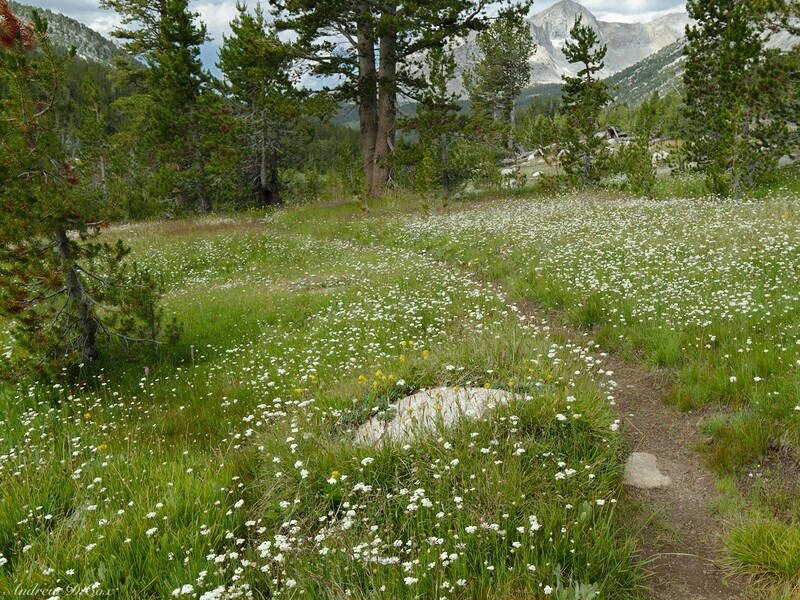 Dozens of wildflower varieties line the trail and fill the air with their sweet perfume. We stroll through this wilderness garden for miles, progressing steadily downhill alongside a gurgling creek. Soon, we find ourselves deep in the canyon, with smooth, white granite walls towering above us. 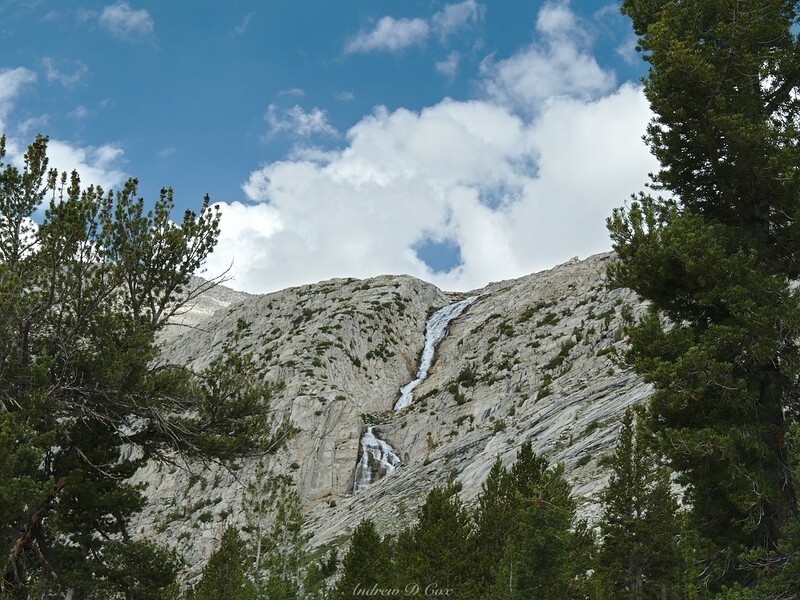 An impressive cascade carrying water from the Royce Lakes hurtles down a cliff further down the canyon, holding our attention for quite a while as we walk closer. 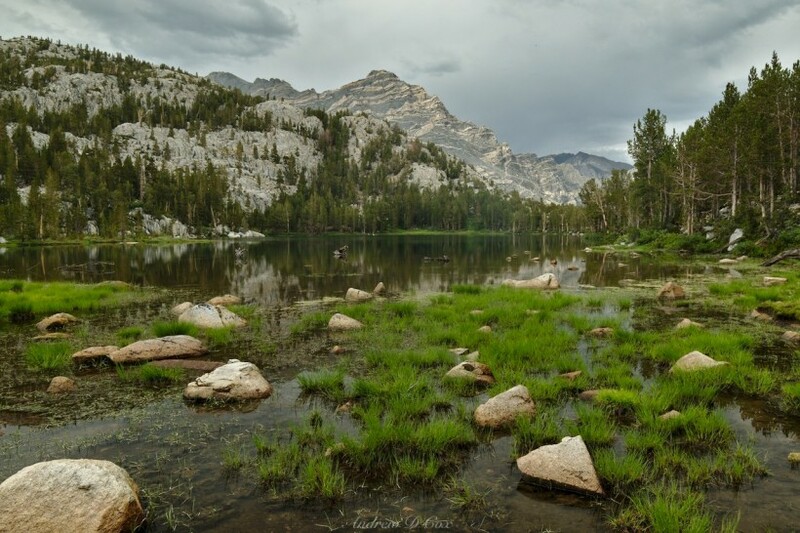 Thanks to the abundance of water and lush meadows, the air is noticeably humid, a strange experience in Sierras; the air is usually very dry! Just look at all those blossoms! After several hours in French Canyon, we reach the trail junction at Hutchinson Meadow. 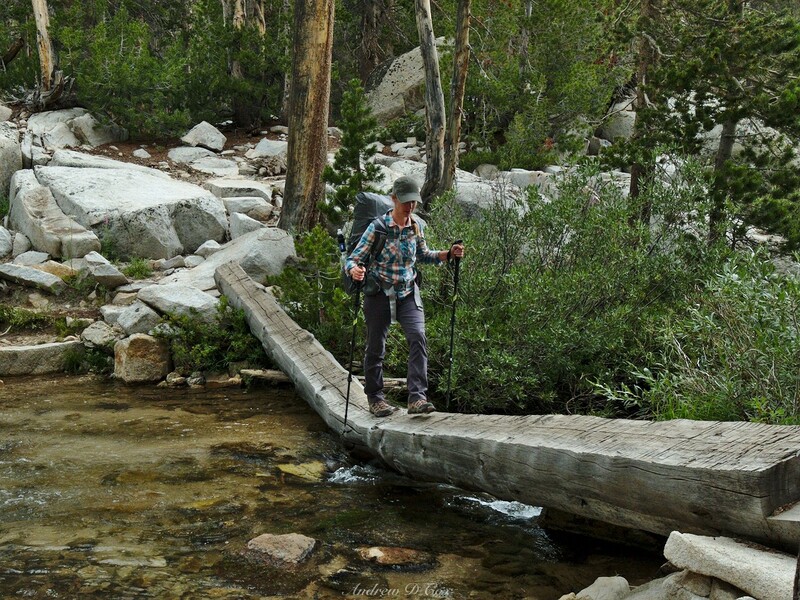 Rather than continue down the Pine Creek Trail to Florence Lake (and the Muir Trail Ranch), we turn east and begin walking up Piute Canyon toward Humphrey’s Basin and Piute Pass. Almost immediately after leaving the meadow, we reach a series of four or five creek crossings and find our way across each of them to reach the other side. After navigating the numerous creek crossings, we begin a long, somewhat dreary walk through a pine forest. Mosquitoes follow us as we tread up the path, taking the opportunity to land and bite whenever we pause for a break. Annoyed at the bugs and a little tired, we each settle into our own pace and walk for a few hours. By the time we reach the edge of the forest, the skies have darkened and thunder rumbles overhead. Anticipating another afternoon of drizzle, we pull on rain jackets and trudge onward; it’s still the early afternoon, so we’ll keep walking for a little longer to make a few more miles. A glance eastward reveals a heavy mist obscuring the distant peaks. A minute later I notice that the mist has drawn closer; now even the nearby peaks are dim through the hazy air. With a feeling of dread, I realize that the mist is actually a sheet of heavy rain moving our way. Thankfully, Diane, Daniel, and Josh are all nearby and we quickly hurry off the trail to a small, sandy patch and begin setting up our tents to shelter from the coming rain. We’re five minutes too late, however, and the torrential downpour arrives before we have the tents erected. Thoroughly drenched, we finish setting up the tents, toss our things inside, and crawl under the rainflys ourselves. However, our relief from the downpour only last a few minutes because we soon realize that our impromptu campsite is smack dab in the middle of a small drainage creek. The rocky ground absorbs none of the water, instead channeling it through the lowest parts of the site. We dig a few channels to divert the water from running directly into the tents, but the ground is already saturated and the tent floor remains a puddle. In addition to rain, the thunderstorm brings a few waves of hail. The tiny ice pellets bounce off the tent and ground, clattering as they impact the fly and the gravel soil. The air grows noticeably chillier, too, and I begin to shiver. Wet clothes, cold air, and huddling in a soggy tent are not exactly conducive to staying warm. Everyone else is getting cold as well and we soon decide to abandon our water-logged campsite. The rain continues to fall, but the thunder has faded, indicating the storm is likely winding down. Even though it’s still raining, it’s probably best that we keep moving to stay warm rather than get even colder. Hypothermia is a very real risk, and it would be great if we all avoided that fate. So, we pack up our sopping wet tents and climb back up to the trail, which consists of a string of puddles and small streams now. My teeth chatter as I walk, so I pick up the pace and hurry uphill to generate some internal heat. 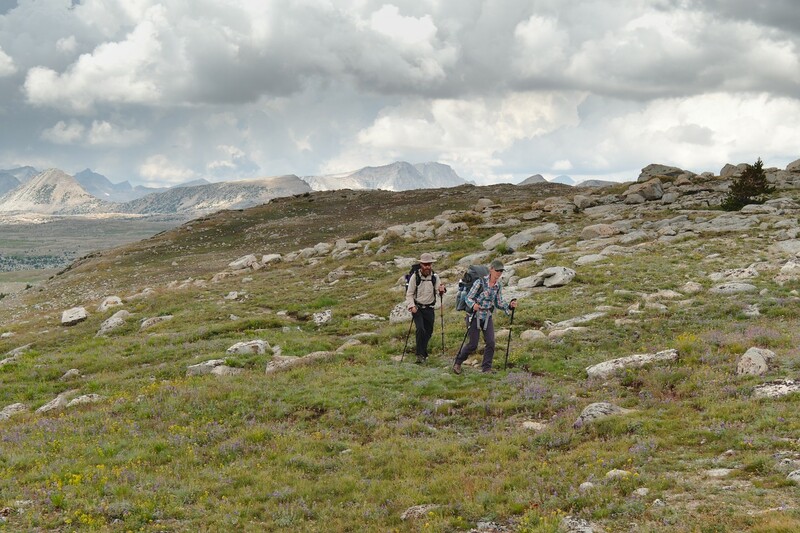 After walking for a short while, we reach the vicinity of Lower Golden Trout Lake and spot a few sandy hills below the trail that ought to provide a better campsite. 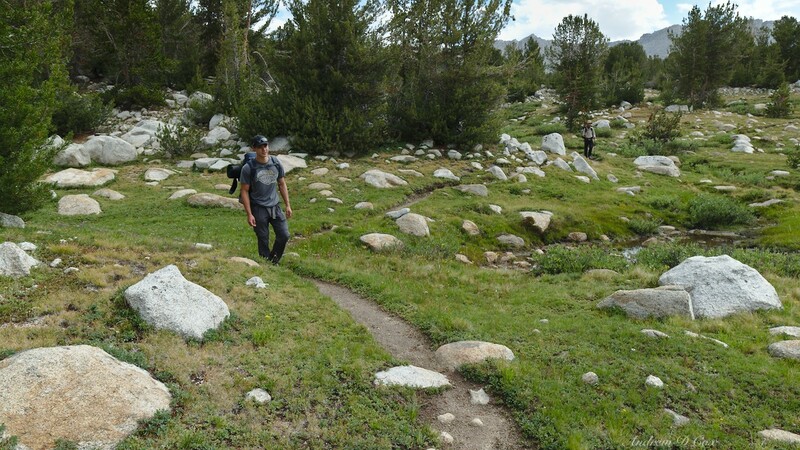 There’s no trail down to the hills, so we leave the Piute Pass Trail and trek cross-country down the grassy slopes toward the lakes and hills below. A few minutes later, we reach the spot we spied from above and set up our tents. The rain has slowed to a drizzle and the ground is more firm, a much better campsite than our previous spot. As we set up the tents, the clouds grow lighter and a tiny sliver of sun peeks through. Slowly, the clouds clear and let more and more light through to illuminate Humphrey’s Basin. We’re all overjoyed to feel the warm rays! With the sun streaming through the still-falling mist, we soon notice a spectacular pair of rainbows stretching over the basin. A closer look reveals extra bands of color past violet on the bottom ‘bow. 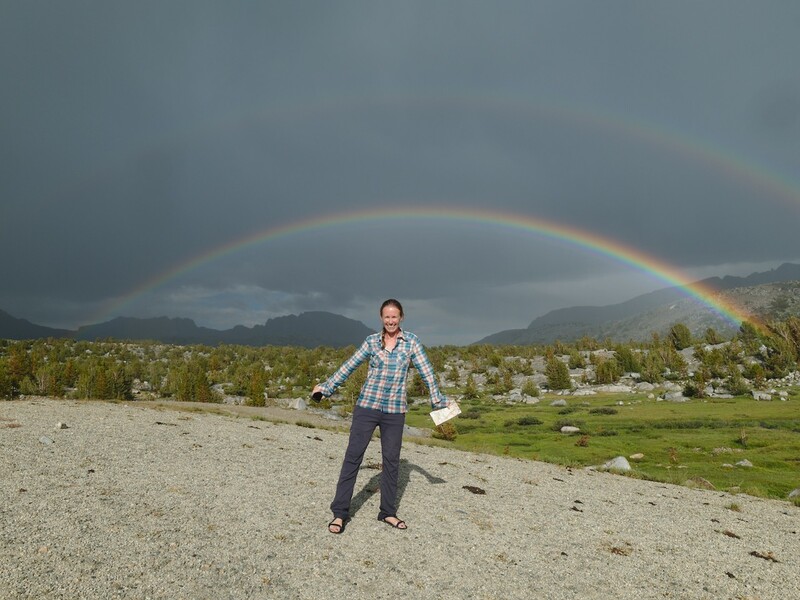 We all lose our minds in excitement; not only is there a bright, stunning, double rainbow, but there are extra, unexplainable colors! 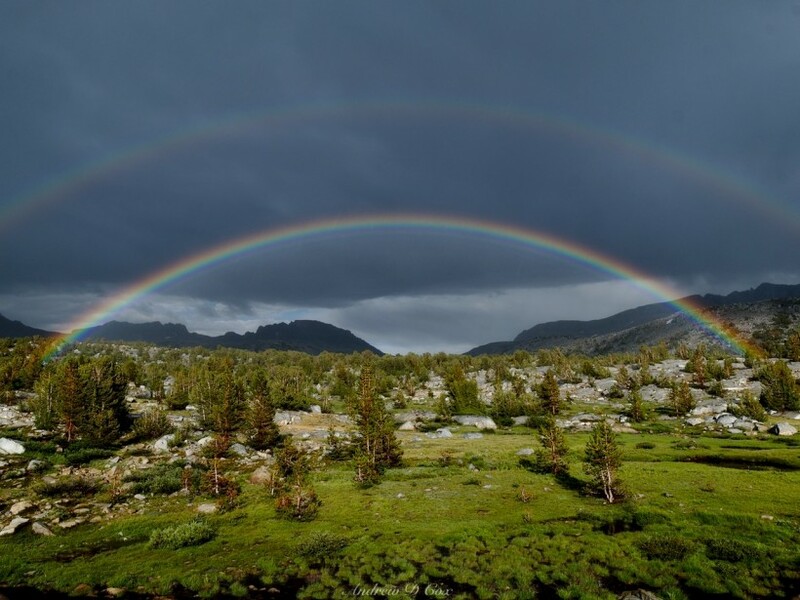 We later learn that this kind of rainbow is called a “supernumerary” rainbow. 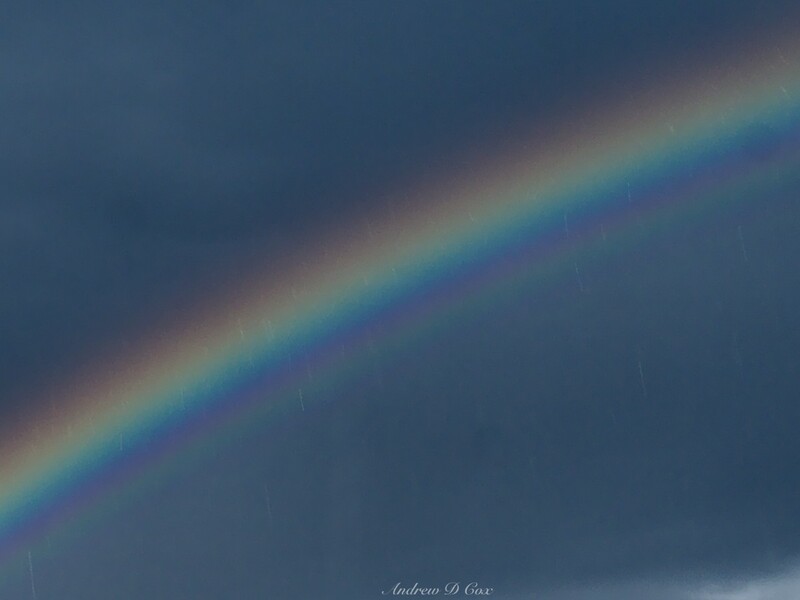 The extra bands of pastel colors appear when light refracts through fine drops of water and the resulting light waves constructively and destructively interfere with one another. How cool is that?! The sunshine is great, but the rainbows are amazing! With the warm sun shining down and the spectacular rainbows to distract us, we’re soon feeling much warmer and happier. Our clothes and tents are still pretty damp, so we hang things out to dry and mop up the water still clinging to the tents. Next, we heat water for dinner; the hot food goes a long way toward lifting our spirits, as does the hot chocolate Diane generously shares. After eating, we explore the area a bit. A handful of small streams wind through the meadows, feeding the numerous lakes below. 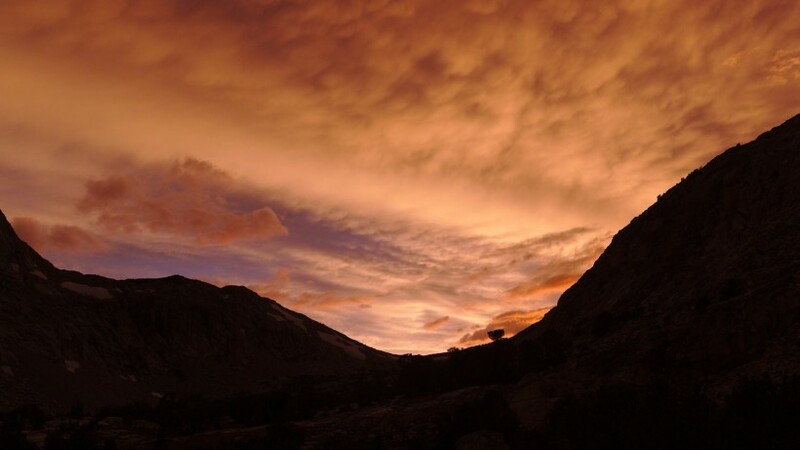 The evening light plays across the peaks, including the magnificent form of Mount Humphreys. The juxtaposition of the stormy clouds and soft light make for some great sights and photo opportunities! As the sun sinks lower toward the western horizon, the clouds begin to change colors, encompassing every shade from red to pink to pale yellow. 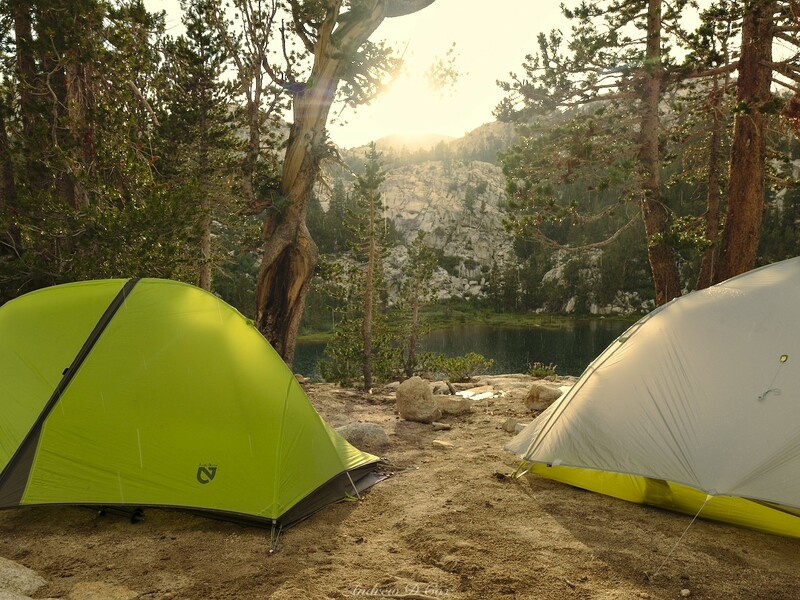 We watch the light show until the color fades from the sky and then trudge back to the tents. The sleeping bags remain dry, thank the gods, and we all enjoy crawling into bed and relaxing. What a day this has been! When I wake up in the morning, I’m happy to find clear blue skies without a single cloud in sight! Perhaps today will be the day when the storms disappear. Soon, everyone is up and enjoying the beautiful, albeit chilly, morning weather. Since we’re in no rush today (we only have a handful of miles if we take the shortest route), we spend a few lazy hours at camp. As soon as the sun peaks above the eastern ridge, we spread all of our wet clothing, tents, and other gear on the numerous boulders scattered around the meadow to dry out. The warm morning sun also feels great on the skin and helps warm us and the air to a more comfortable temperature. An hour or two later, all of our gear is dry and warm, so we pack everything up and say goodbye to our little campsite. A short cross-country trek along the Desolation Lake outlet stream brings us back to the trail. 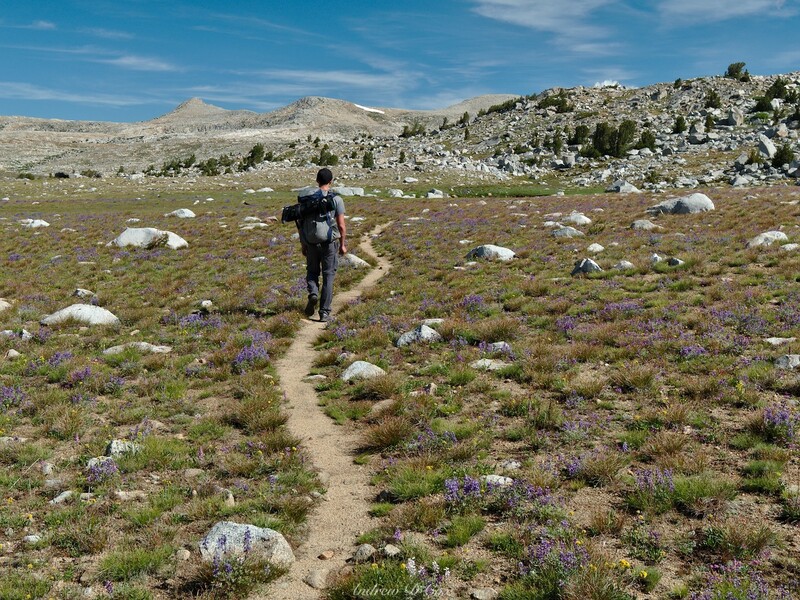 The single-track path winds through the pristine alpine wilderness: vast meadows dotted with granite and wildflowers. Impressed with the beautiful scenery, we pause plenty of times to take pictures and admire the views. 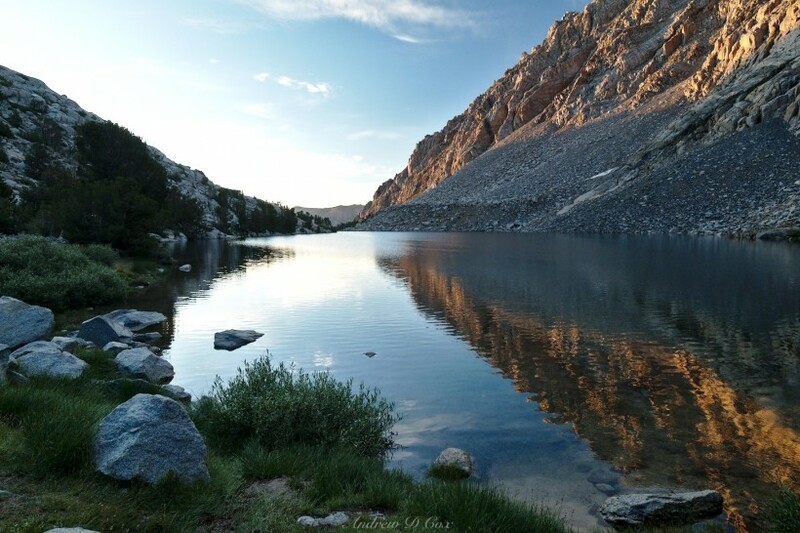 Since we have all day to travel just a few miles to our final campsite, we decide to make a detour off the Piute Pass trail to visit Desolation Lake. 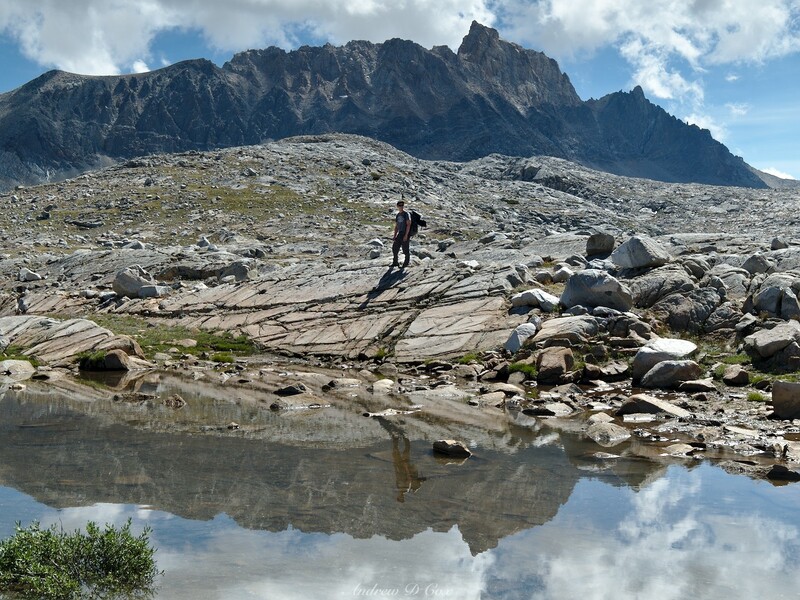 Additionally, rather than backtrack along the same trail, we’ll trek cross-country up to Forsaken Lake, over Forsaken Pass, to Humprey’s Lakes. 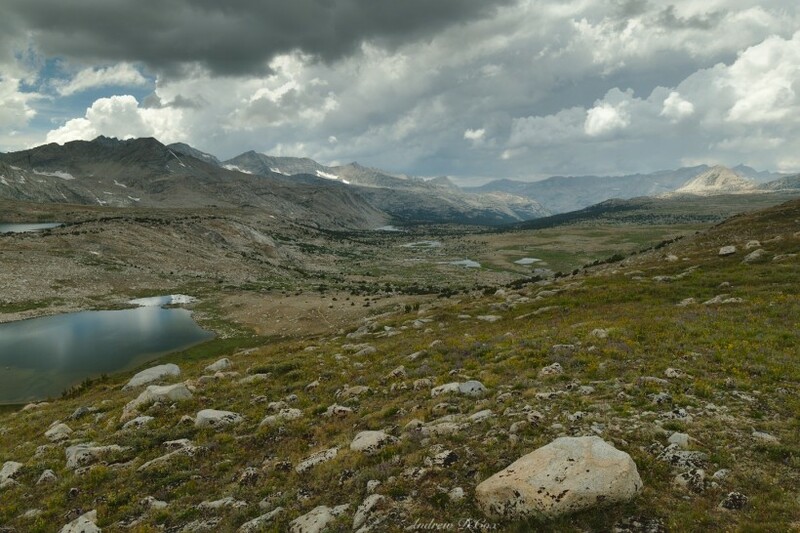 From there, we’ll follow a trail back to Piute Pass and descend to one of several lakes below the pass. We have some difficulty locating the trail to Desolation Lake, a faint side route marked by a small cairn. But, locate it we do, and we take off to the north toward Mount Humpreys through the alpine meadows. We lose the faint trail one or twice as we pass through fields of boulders, but, between the four of us, someone always locates it again. Some time later, we reach the shores of Desolation Lake, a huge body of water beneath the imposing mass of Mount Humphreys. A faint breeze ruffles the long grass lining the lakeshore, and wildflowers nod in the wind. We follow an even fainter path along the shore to a small peninsula where we take a break to soak our feet, eat some snacks, and relax. Desolation Lake is massive and stretches on for quite some distance! After a lovely break on the banks of Desolation Lake, we take off toward Forsaken Lake, a small pond hidden somewhere above. With some careful footwork, we follow the map and navigate the marshy meadows full of snowmelt to the banks of Forsaken Lake. 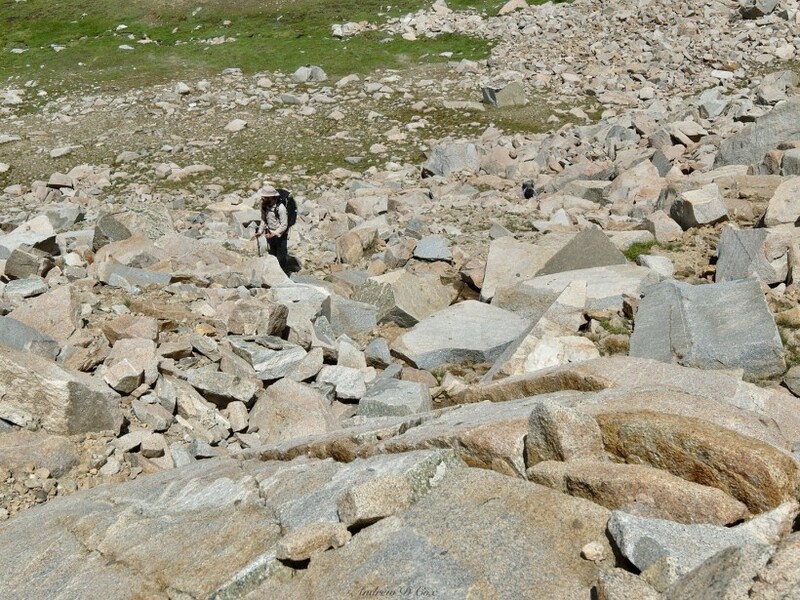 Above the lake, we scramble up talus to reach a low saddle between Forsaken Lake and Humphrey’s Lakes to the south. The ascent isn’t terribly difficult – perhaps class II – but enough of a challenge to be incredibly fun and rewarding. By the time we reach the saddle, i.e., Forsaken Pass, everyone is smiling and excited to be trekking cross-country. 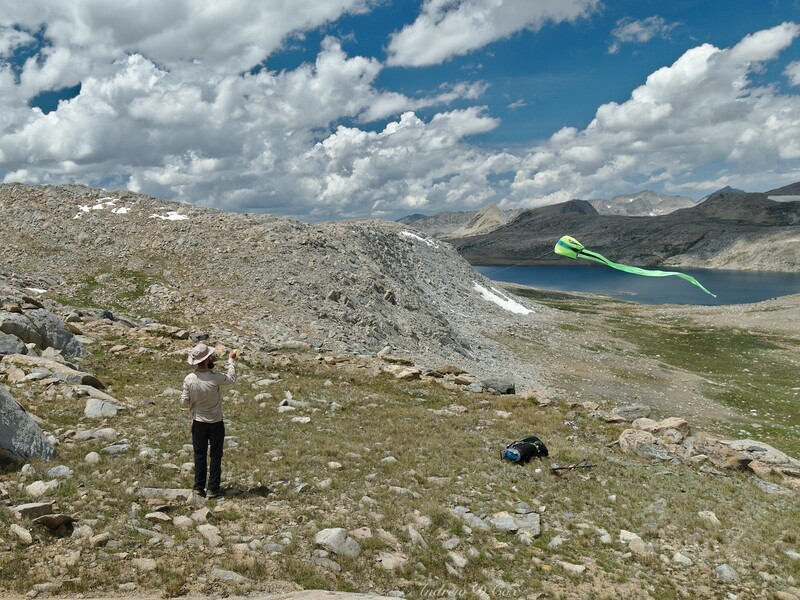 The strong breeze from the top of Forsaken Pass supplies the perfect conditions for Daniel’s kite, which he flies for several minutes atop the saddle. The scene is full of whimsy; flying a kite seems so young and innocent, which dramatically juxtaposes the barren, aggressive vibe of the rocky pass. Puffy clouds drift overhead, an indication that we may very well have another rainy afternoon. The day is still young, however, so we take some time to enjoy lunch while sitting near a small tarn nestled on the ridge. 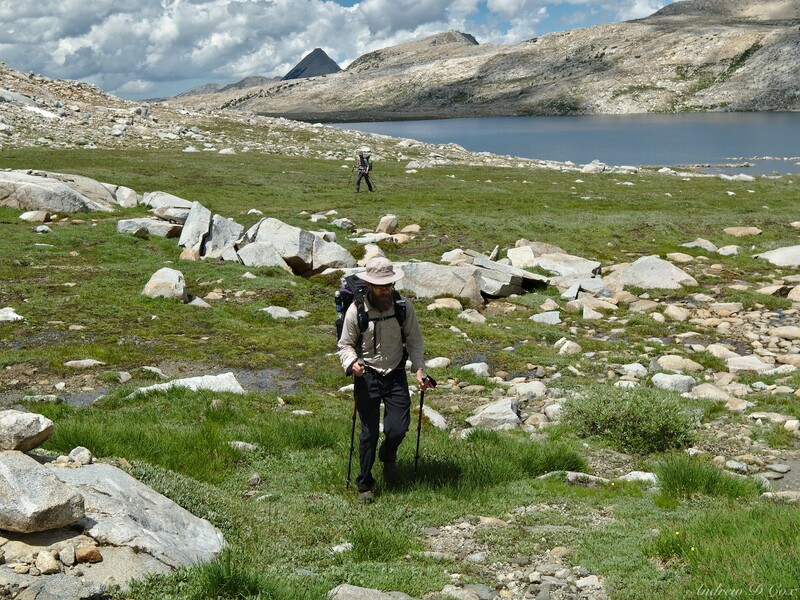 After eating, we continue down easy terrain to Humphrey’s Lakes. 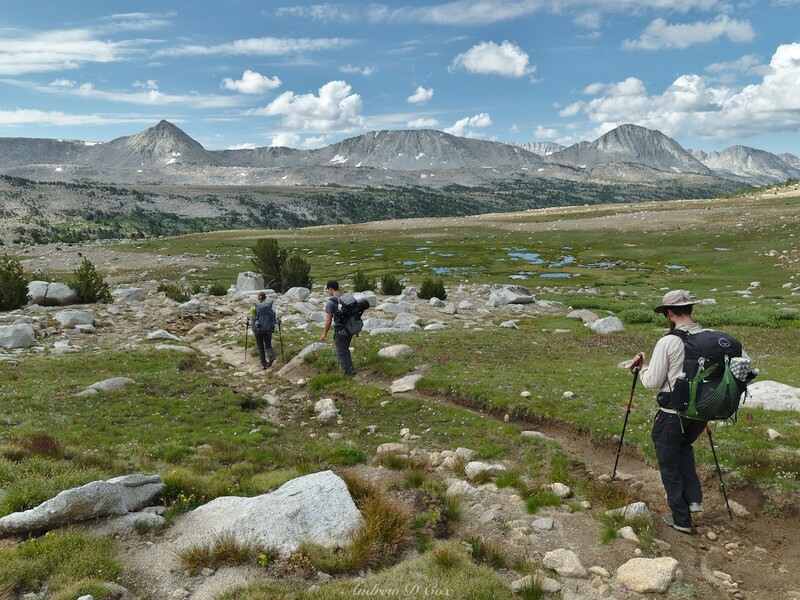 The trail plotted on the map is nowhere to be seen, so we continue our off-trail trek toward Piute Pass. 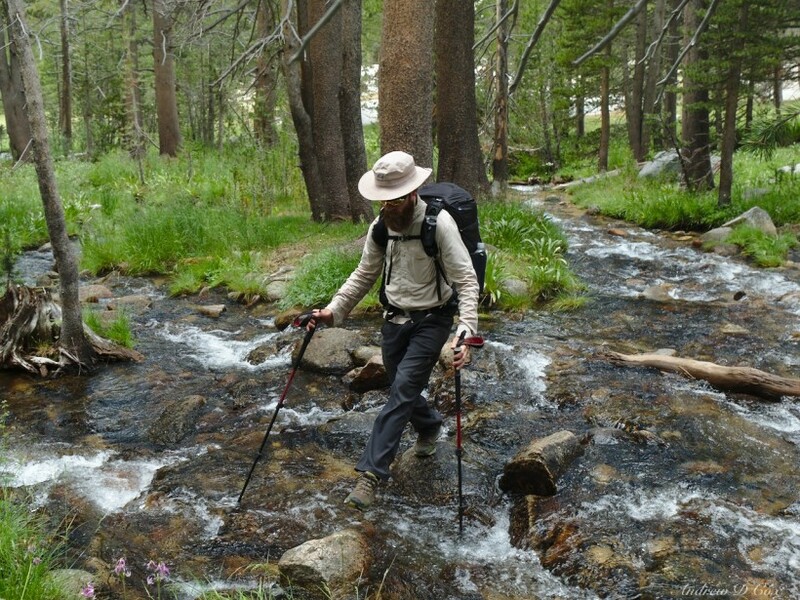 We hike easily down numerous grassy ramps, past creeks and lakes, checking the map as we go. It’s not super straightforward to identify our exact location, but we eventually cross an extremely faint path and follow it south and west, the general direction to Piute Pass. Bent grass and the occasional cairn guide us to a ridge with an excellent view of Humphrey’s Basin. 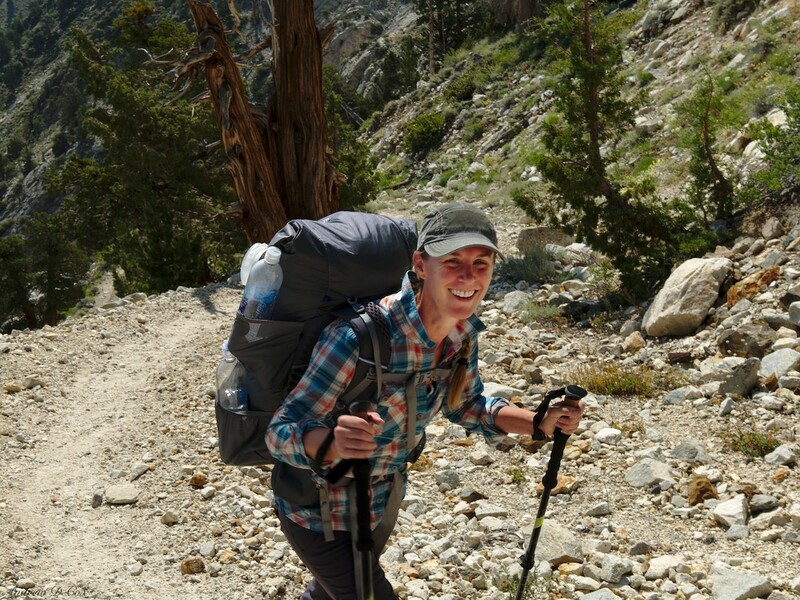 The Piute Pass Trail snakes up the valley far below, and we spot several backpackers hiking down along its length. 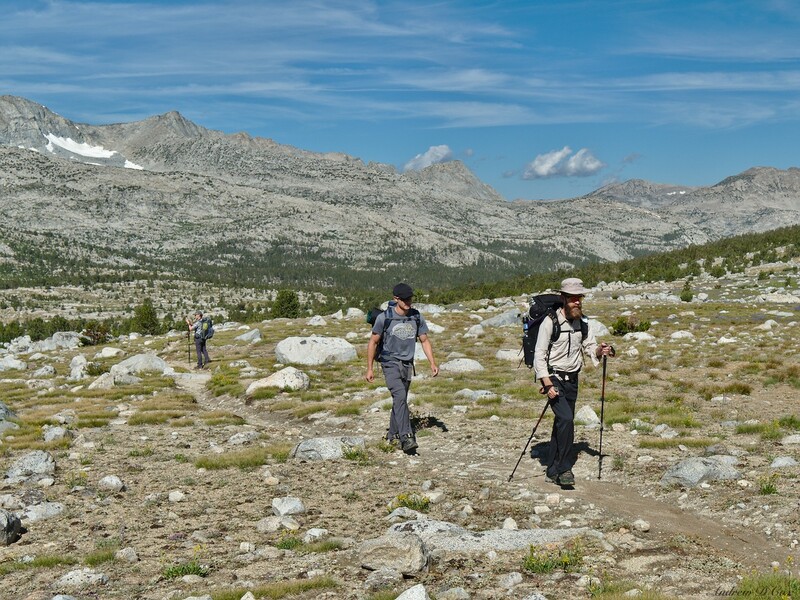 We drop down from the ridge to Piute Pass, and then follow the well-traveled path down switchbacks toward Piute Lake. Many of the steps built into the trail are full of water from the recent rainstorms, and, by the look of the dark sky overhead, we’ll have another storm this afternoon. As we descend, the heavens open and a light rain begins to fall. Soon, the rain turns into heavy hail; we take shelter beneath a stand of junipers until the hail dies out. 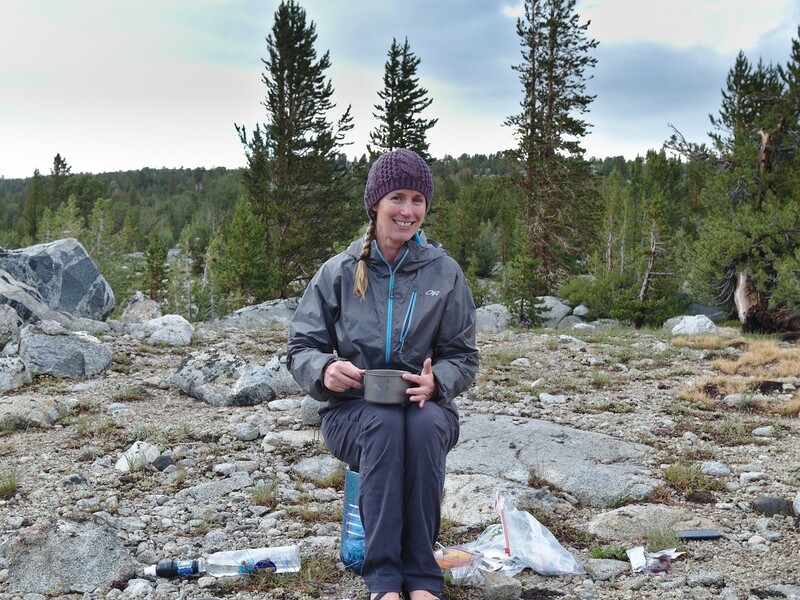 With even darker skies in the distance and yesterday’s deluge fresh in our minds, we hurry down the trail and find a campsite near Piute Lake, taking care to ensure we won’t end up in the middle of a stream again. 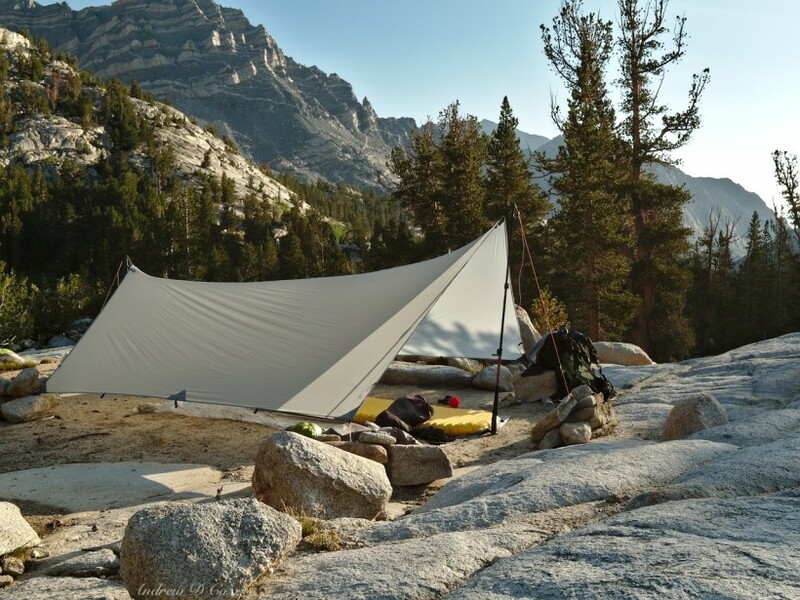 We pitch the tents, toss in our gear and… wait. A few minutes later, the rain increases in intensity and we take shelter. Thankfully, we’re much more prepared for the downpour than yesterday. 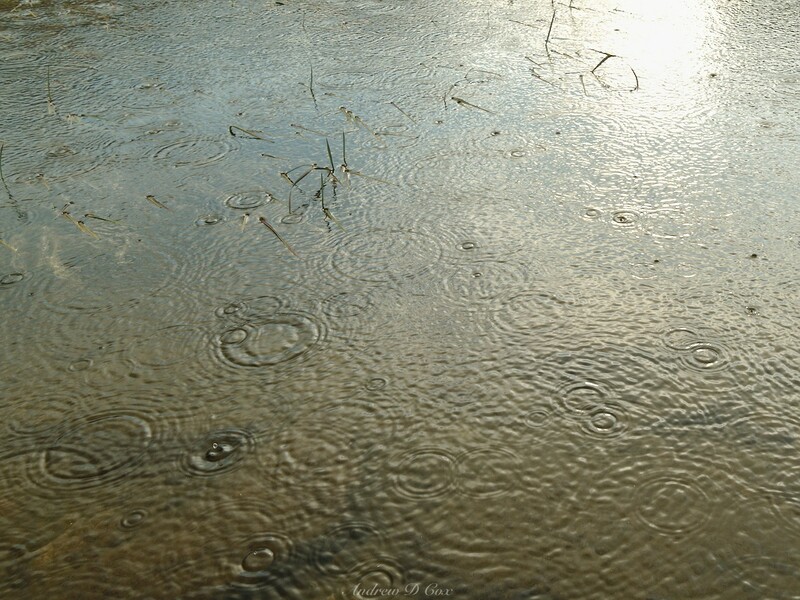 Unfortunately, the rain lasts for quite a while. Thunder booms overhead, rain pours down, and the hours tick by. Eventually, the thunder quiets down and the rain lightens to a drizzle, although it doesn’t stop completely. After lying in the tent for what feels like forever, I’m thoroughly bored and hungry. We cook dinner out in the cold drizzle, and then return to the tents to stay dry. At some point, we realize that the keys to the car parked at this end of the trail are locked in the car that we left at Pine Creek, thus, we have no way to unlock or drive the car we’ll return to tomorrow. So much for our easy transportation… we’ll just have to hitchhike back to town in the morning. Finally, late in the evening, the rain stops and the overcast skies break into scattered clouds. With the sun low on the horizon, the clouds catch every ray, reflecting all kinds of bright colors. It’s another amazing light show after a tedious storm, a sort of “I’m sorry” from Mother Nature for the rain. 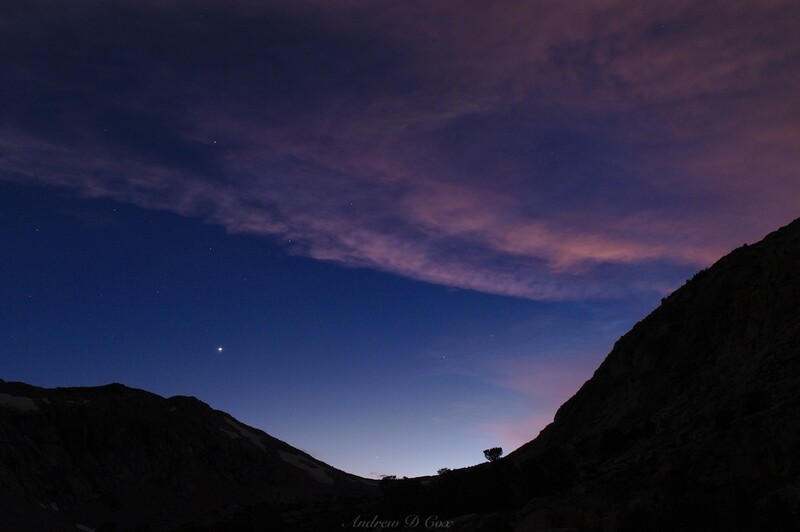 We stay up for a while as the light fades and the stars appear; the light is beautiful and standing around outside is a nice change of pace from the confines of our tents. However, as night falls, the temperature drops and we retire to the warm sleeping bags waiting in the tents. With the prospect of having to hitchhike to town, we get up early and pack up camp. It’s another beautiful, nearly cloudless morning and I enjoy snapping a few photos of the mountains reflected in Loch Leven. The descent is pretty straightforward except for a section of trail below Loch Leven traversing a rocky slope. The recent rains (we later learned) caused a rockslide, and we lose the trail once or twice on the way down. After a little backtracking, we relocate the path and make good time toward the trailhead, arriving just a few hours after leaving camp. We ask around the campsite at the trailhead, but nobody seems to be leaving for town. Back at the parking area, we find a few folks at the nearby pack station. One very kind man, Steve, lends us his car to go and pick up our other vehicle. 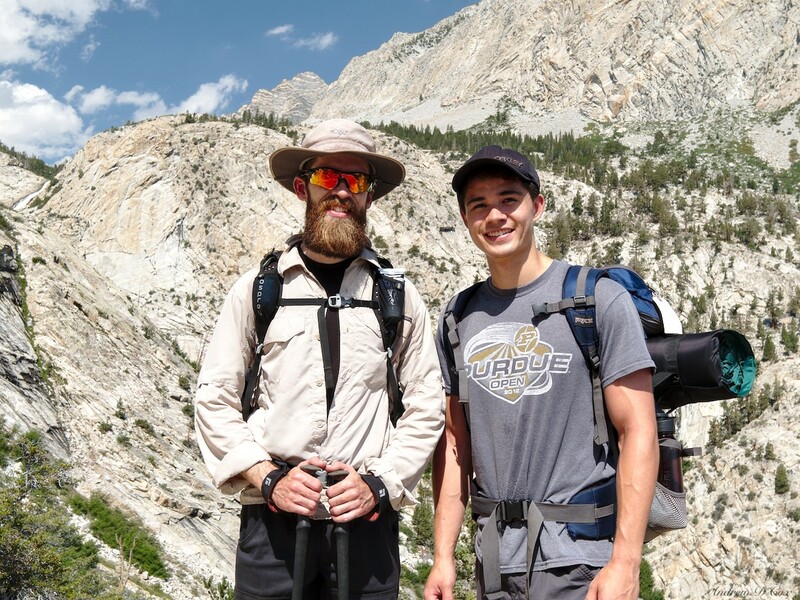 Incredibly grateful for Steve’s generosity, we hurry off and pick up the second car, retrieve the keys, and return to the Piute Pass Trailhead. With both cars, we drive back to town, find a coffee shop and munch on tasty pastries and sip on hot, delicious coffee. Elba lake near pine creek pass. Great trip! But must have good waterproof tent and know when to use it. Thanks, Douglas! I did hear about the road; I thank my lucky stars that my friends and I made it out before the flooding.